For decades collectors have been known to write to their favorite star. Often, the fan would ask for an autograph to have as a keepsake, but from time to time they seek for a little bit more. 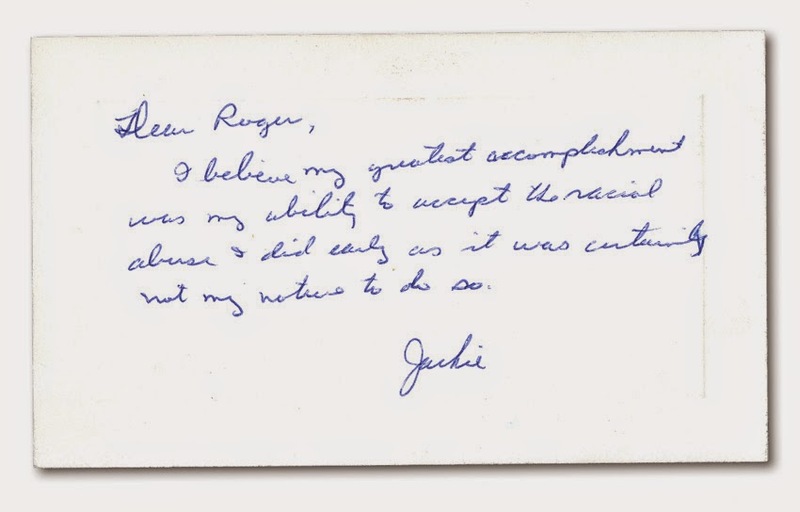 Featured in this post is a little bit of Dodger Correspondence from Jackie Robinson to a collector that is certainly notable. It is available on auction at SCP. 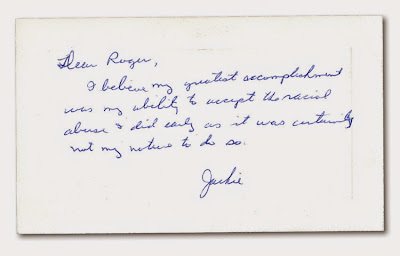 As you can see, a fan named Roger asked Jackie what he believed was his greatest accomplishment in his career. Jackie responded by noting his willingness to turn the other cheek. I think we can all agree that he was right. 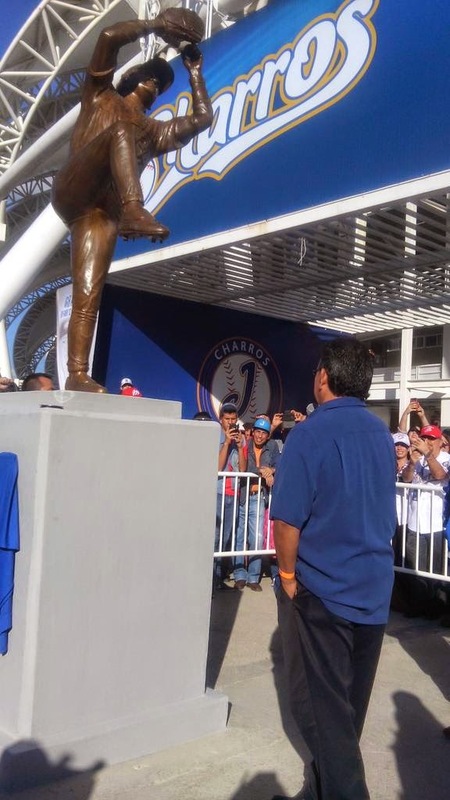 Check out Fernando Valenzuela gazing upon a statue of himself that was erected this past weekend at Charros de Jalisco's ballpark in Guadalajara. Photo via @charrosbeisbol on twitter. As you can see, it features him looking to the heavens as he prepares his pitch. Mark Townsend at Big League Stew has more on Joc Pederson's car. It has been sold on eBay for $1,200.00. He also tells us a bit about the seller, who had purchased it from the winner on fan appreciation day in Albuquerque. Via Adam Berry at MLB.com, "Puig comes up big in Tokyo." You can also check out a bunch of pics from the game at Tokyo, here, from Dodger Insider Jon Weisman. "The way they were attacking Yasiel in the first three games and really not giving him too much to hit, to put him in front of [Rockies first baseman Justin] Morneau was an opportunity for him to see some pitches. It worked out," MLB manager John Farrell said. "They threw the ball in the strike zone, and he responded with three hits tonight. Via J.P. Hoornstra at Inside the Dodgers, "Dodgers senior VP Josh Byrnes on Billy Gasparino, Ryan Jackson." Via Cary Osborne at Dodger Insider, "Adrian Gonzalez on the offseason, Julio Urias, baseball in Mexico and Canelo Alvarez." Best Prospect: After a rough AFL performance in 2013, shortstop Corey Seager played much better the second time around, batting .281/.354/.472 with a league-best 10 doubles. The 2014 Minor League leader in hitting (.349) and doubles (50), he'll produce for average and power but will likely have to move to third base. . Via TheThinGwynn at Gaslamp Ball, Topps is issueing a Johnny Manziel San Diego Padres autographed Baseball card.